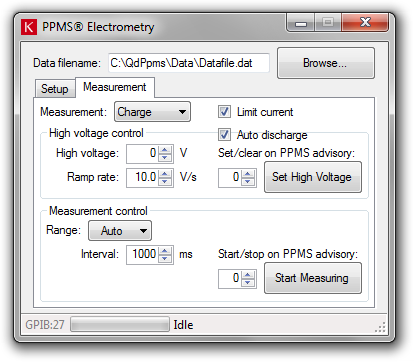 Our PPMS Electrometry software interfaces with the Keithley Model 6517B electrometer to perform resistance, current flow and charge accumulation measurements on high resistance samples in the controlled temperature and magnetic field environment of the PPMS instrument. The software runs concurrently with the PPMS MultiVu application on the PPMS control PC and provides direct control of the Model 6517B. Measurements are set up in the software prior to initiation of a regular PPMS measurement sequence in MultiVu, which then triggers the Keithley at appropriate points through a standard sequence command. 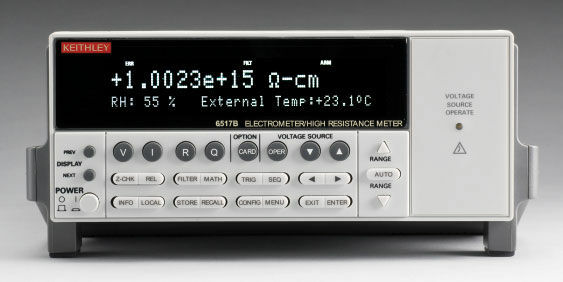 The software presently supports continuous charge, current and resistance measurements under user-defined application and removal of a specified high voltage. However, the software is designed to be easily extensible to meet customer requirements in terms of additional measurement protocols. The software is offered under licence, and a fully-functional evaluation copy is available upon agreement to the licensing terms. If, on using this software, you determine that our programming expertise could be of benefit to your own activities, we are prepared to adapt the software to your specific requirements. Please contact us for further details. PPMS is a registered trademark of Quantum Design, Inc. These products are not endorsed or approved by Quantum Design or Novocontrol Technologies.